In addition to the internal presentations, we had the honour to host Professor Dame Janet Thornton from the European Bioinformatics Institute (EMBL-EBI) in Cambridge, UK. She gave the keynote lecture on the ‘Drug repurposing for aging research.’ Sara Brown and Colin Murdoch from the School of Medicine also gave talks on their research. Fifty-one posters were presented over the two sessions and were judged by postgraduate students and early career researchers. 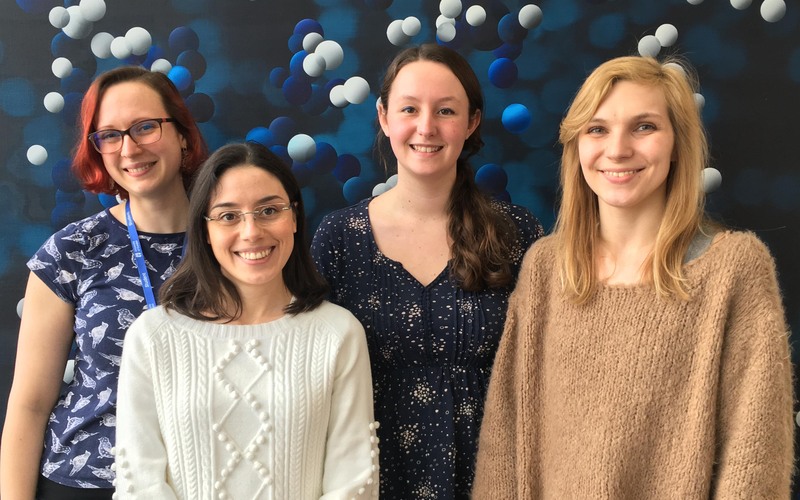 Prizes were awarded to Virginia De Cesare (Virdee lab, MRC PPU) in first place with Helen Brown (Findlay lab, MRC PPU), Julia Wcislo (Read lab, BCDD/WCAIR/DDU) and Elena Purlyte (Alessi lab, MRC PPU) placed joint second. Virginia presented a poster entitled ‘Investigating non-canonical deubiquitylation by MALDI-TOF mass spectrometry’. Helen's poster was entitled, ‘ERK5 induces embryonic 2-cell stage genes through a KLF2-ZSCAN4 auto-regulatory module.’ Julia's poster was entitled ‘Chagas Disease: A new approach for identifying the localisation of Trypanosoma cruzi persisters in organs of chronically infected mice directly after drug treatment.’ while Elena's was entitled, ‘Phosphorylating LRRK2 substrate Rab GTPases in vitro using MST3 kinase - a tool for effector assays’. Photo (left to right): Elena Purlyte, Virginia De Cesare, Helen Brown and Julia Wcislo.